Charles Wilton Illingworth was born in late 1891 in Ossett, the son of Andrew Illingworth and his wife Sarah (nee Illingworth) who had married on April 22nd 1889 at South Ossett Christ Church. At the time of the marriage, Andrew was a 33 year-old cloth drawer, the son of Benjamin Illingworth, clothier and his new wife, 30 year-old Sarah Illingworth was the daughter of Joseph Illingworth, clothier. It is possible that the bride and groom were cousins. At the time of Charles Illingworth's birth, his parents were living at Rock Cottages, near Sowood Farm and it is very likely that he was born there. By 1911, the Illingworth family had moved to a four-roomed house at 6, Grove Street, Ossett and Charles now has sister, Mary E. Illingworth, born 1895. In 1911, Charles, now 19 years of age, was working as a clerk in a fellmongers. Charles' father Andrew died at the age of 57 on the 5th June 1913 and he was buried at South Ossett Church on the 7th June 1913. 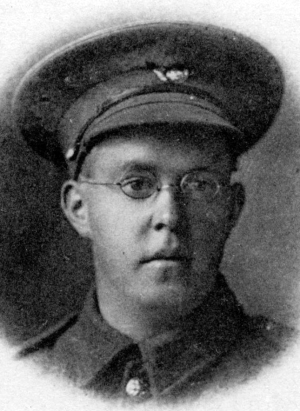 Charles Illingworth enlisted in the army on the 11th December 1915 as a volunteer and joined the Northumberland Fusiliers with the service number of 42290, giving his next of kin as his mother Sarah Illingworth, 6, Grove Street, Ossett. He was placed in the Army Reserve on the 12th December 1915 and then posted on the 23rd May 1916, transferring to the 1st/8th Battalion, Durham Light Infantry on the 20th of October 1916. The 1st/8th Battalion of the Durham Light Infantry was formed in August 1914 at Bishop Auckland as part of DLI Brigade, Northumbrian Division. They moved to Bolden Colliery in early August, then to Ravensworth Park and were at Newcastle by October 1914. On the 17th April 1915, the Battalion landed at Boulogne and on the 14 May 1915 they joined 151st Brigade in the 50th (Northumbrian) Division. On the 3rd June 1915, after taking heavy casualties, 1/6th and 1/8th Battalions merged to form the 6/8th Battalion. After reinforcements, they resumed their original identities on the 11th August 1915. On the 15 July 1918, the Battalion was reduced to cadre strength and transferred to Lines of Communication, then on the 16 August 1918, they transferred to 117th Brigade in 39th Division and on the 6th November 1918, the Battalion was disbanded in France. Private Charles Wilton Illingworth was killed in action aged 24 years just 15 days after being transferred to the Durham Light Infantry in the disastrous attack on the Butte de Warlencourt on the 5th of November 1916 with the 1/8th Durham Light Infantry and the 1/6th Durham Light Infantry suffering huge casualties. On the 5th November 1916, three Battalions of the 151st Infantry Brigade were to assault the Butte de Warlencourt, a 50ft high prehistoric burial mound in the centre of a man-made swamp, near the village of Warlencourt on the Somme battlefield and used as an observation point by the Germans. It was heavily fortified with barbed wire, machine guns, tunnels and mortars. The British Army tried to capture it several times in the Autumn of 1916; the first attack was on 1 October by the 141st Brigade of the British 47th (1/2nd London Division). Each Battalion being on a frontage of three Companies with one Company in reserve which was to remain in Maxwell Trench. The 9th D.L.I. was on the left, the 6th D.L.I. in the centre, and the 8th D.L.I. on the right. At 9 a.m. the assaulting Infantry moved forward. These troops were in four lines with a distance of 15 yards between each line. The 6th D.L.I. and 8th D.L.I. when they had gone forward about 50 yards came under very heavy machine gun fire, which caused them many casualties and prevented them from reaching their objectives although many heroic efforts to get forward were made. The Australians on the right were met by intense machine gun fire and they too were unable to make any progress. On the left the 9th D.L.I. met with less opposition and succeeded in gaining all its objectives without suffering heavy casualties. The German Barrages came down at about four minutes after nine-o-clock. The ground had been so pulverised by our Bombardments and was so muddy that it was not possible to do much in the way of consolidation. But the men were ready with their rifles. The Germans had now realised the scope of our attack and many of their Batteries concentrated their fire on our new positions. Snipers from Warlencourt-Eaucourt were subjecting our men to a deadly fire and it was almost impossible for them to move. The Germans in the dugout on the northeast edge of the Butte had brought a machine gun into position and were worrying us from behind. Many gallant attempts were made throughout the day to capture this dugout but without success. All our Parties who tried to rush it were destroyed by the German machine gun fire from the direction of Hook Sap and by the fire of the large number of snipers in Warlencourt. However a Party did succeed in throwing some Mills Grenades into the dugout and this made the Boches more cautious. The first German counter-attack was made about 12 noon. It was a half hearted one and was easily stopped. During the afternoon the enemy launched several bombing attacks but these too were repulsed. About 6 p.m. the Germans made a determined counter-attack preceded by a terrific bombardment and were able to get to close quarters. A tough struggle ensued. But our men who had now been reinforced by the Reserve Company and who showed the traditional superiority of the British in hand to hand fighting, succeeded in driving out the enemy. The 9th D.L.I. was getting weak, but it was hoped that the Boche had now made his last counter-attack for that day. It had happened that the Bavarian Division which was holding the line when we attacked was to have been relieved on the night of the 5th/6th November by the Prussian Guards Division. At about 11 p.m. Battalions of the Prussians delivered a fresh counter-attack. They came in great force from our front and also worked round from both flanks. our men were overwhelmed. Many died fighting. others were compelled to surrender. It was only a handful of men who found their way back to Maxwell Trench and they were completely exhausted by their great efforts and the strain of the fighting. There were many reasons why the 9th D.L.I. was unable to hold its ground. The failure of the troops on the right to reach their objectives and the fact that the Division on our left was not attacking caused both flanks of the battalion to be in the air. The positions to be held were very much exposed and the Germans could see all our trenches and control their fire accordingly. It was a local attack and the enemy was able to concentrate his guns on to a small portion of our line. The ground was a sea of mud and it was almost impossible to consolidate our Posts. The terribly intense German barrages and the difficult nature of the ground prevented reinforcements from being sent up to help the 9th D.L.I. Four hundred yards north of the Butte the enemy had a steep bank behind which they were able to assemble with out being molested. 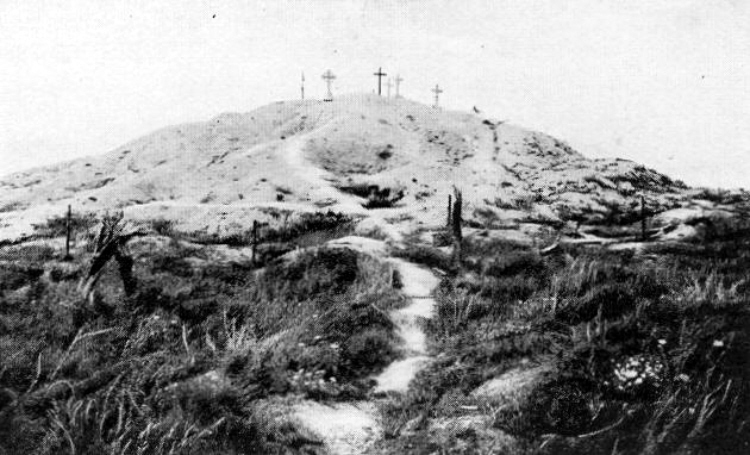 Above: The Butte de Warlencourt shortly after the war ended. The Butte marked the very limit of the British advance on the Somme and King George V visited the Butte in July 1917. Private Charles W. Illingworth is remembered Pier and Face 14 A and 15 C of the Thiepval Memorial 2, Somme, France. The Thiepval Memorial will be found on the D73, next to the village of Thiepval, off the main Bapaume to Albert road (D929). On 1 July 1916, supported by a French attack to the south, thirteen divisions of Commonwealth forces launched an offensive on a line from north of Gommecourt to Maricourt. Despite a preliminary bombardment lasting seven days, the German defences were barely touched and the attack met unexpectedly fierce resistance. Losses were catastrophic and with only minimal advances on the southern flank, the initial attack was a failure. In the following weeks, huge resources of manpower and equipment were deployed in an attempt to exploit the modest successes of the first day. However, the German Army resisted tenaciously and repeated attacks and counter attacks meant a major battle for every village, copse and farmhouse gained. At the end of September, Thiepval was finally captured. The village had been an original objective of 1 July. Attacks north and east continued throughout October and into November in increasingly difficult weather conditions. The Battle of the Somme finally ended on 18 November with the onset of winter. In the spring of 1917, the German forces fell back to their newly prepared defences, the Hindenburg Line, and there were no further significant engagements in the Somme sector until the Germans mounted their major offensive in March 1918.